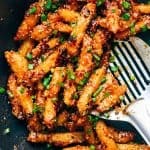 Crispy Honey Chilli Potatoes are a super addictive snack – fried potato fingers are tossed in a sesame honey chilli sauce that’s sweet and spicy and will give you sticky fingers that you’ll be licking. You can use the same recipe to make honey chilli cauliflower, honey chilli mushrooms, honey chilli lotus stem etc – the possibilities are really endless! Lets just say we ate these straight from the wok. Because there was noone to stop us. But if you are in a family situation where that is not acceptable, I can’t help you. If you have eaten honey chilli potatoes, what really stands out is how crisp these potatoes are, in spite of being tossed in the sauce. They can really stand out for their crunch. And that’s really what this recipe is all about. We really went all out to achieve that texture and taste. To make sure that soggy potatoes don’t make it to the table because thats what makes these honey chilli potatoes so awesome. And you know me, when we are on a mission, we really go all out. So this recipe was tested multiple times with different batters, different proportions, timings etc. And finally we came to the conclusion that the key is to batter fry the potato fingers twice. The key to making super crispy honey chilli potatoes is to batter fry the potato fingers twice. Deep frying them only once results in potatoes that don’t hold their shape and get soggy after a few minutes. So the potatoes are first coated in a dry mixture, deep fried till they are almost cooked and then cooled for a bit. They are then coated in a second coating of batter and deep fried again till they are really crisp outside and cooked perfectly inside. The last step is to coat them in a sesame honey chilli sauce that adds an extra layer of texture and is sweet and spicy. These are not particularly saucy and they shouldn’t be. Because they are not meant as a side. They really are an appetizer or more like a bar snack to serve with beer or mocktails. So what you should do is hand out some toothpicks and let people dig in, or if your friends are like ours, they’ll just use their fingers. « Vegetable Pakoras – Super crispy GF fritters that disappear in minutes! Hi! This sounds delicious. The recipe states to fry until half cooked. About how long would that be? Hey Richa☺ How do you make Red chillie paste for this recipe? Hey Cesalyn, to make the red chilli paste, soak a few dried chillies in warm water for 20-30 minutes and then grind them to a paste. A mortar pestle should do the trick. Very delicious appetizer. The whole bowl got finished immediately. Preeti Mam!! It really sounds lovely to make and it is also easy to make. As your Recommendation and guidance, I will also try my hands on the honey chili potatoes. Thank you, mam and I’ll be awaited for your next Blog. Keep Writing. Thank you so much Kushal! Hi! This recipe looks delicious but I cannot eat fried food. Is there a way to do this in the oven?? Hey Alicia, unfortunately there’s no way to make these in the oven because they are double fried for that super crisp texture.